The verdict is in! The scariest books have been narrowed down to just one. We’ve enjoyed these weekly show-downs between our creepy favorites, but now that Halloween is upon us, it’s time to announce a winner! In an extremely close final round, a modern horror masterpiece won out over a classic of the genre. 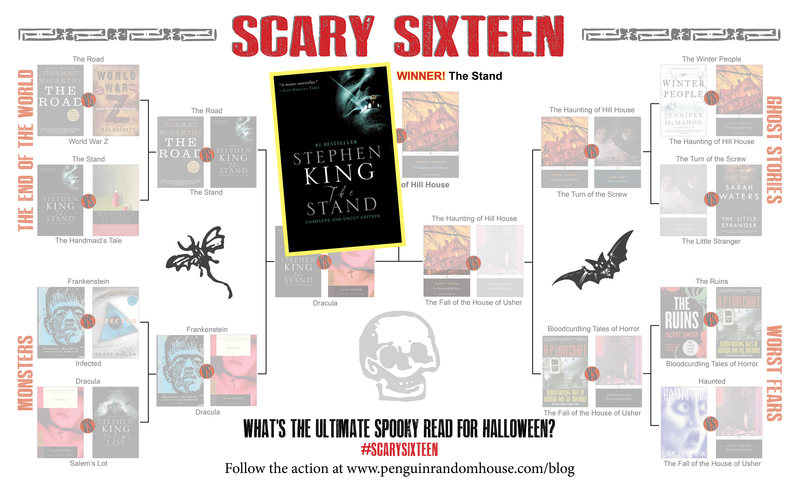 Stephen King’s The Stand has beaten Shirley Jackson’s The Haunting of Hill House and is officially the ULTIMATE SPOOKY HALLOWEEN READ! Will you be picking up The Stand this Halloween? Was Shirley Jackson robbed? Were there classic horror books that you think should have made it onto this bracket? Let us know what you thought of our Scary Sixteen tournament using #scarysixteen. Congratulations to our sweepstakes winner: Jessica, from Costa Mesa, CA. She’ll receive a Penguin Horror Classics set, edited by lifelong horror literature lover, Guillermo Del Toro. If you’d prefer to buy from an independent bookseller, check out IndieBound to find a bookstore near you. Read It Forward has teamed up with literary clothing company, Litographs, for a special giveaway! Enter to win 1 of 5 prize packs that each include a gorgeous new edition of a classic. Thanks to our friends at Litographs, the winners will each take home a clothing item (tote bag or t-shirt) made entirely from the words of the book it depicts. Deadline for entry is 11:59 P.M. (Eastern Time) on June 29, 2015, so enter now!